Privilege is one of those trigger words that forces people to stop reading, and start reacting. It’s a word that I often omit from dialogue — online and off — when I know that I may trigger someone to stop hearing me out on an issue. The concept remains a vital piece of my political analysis, but I often feel that I have to argue that privilege is a real thing before I can get back to my original point. This is exhausting. I feel that many people use the word to stifle debate. If someone makes a point that I know is wrong, it may be the fact that the person enjoys a relative (or immense) amount of privilege that prevents them from seeing a bigger picture. However, simply because that person is privileged is not reason enough for them to be wrong on a given issue. That’s why I don’t tell people to check their privilege when arguing a point anymore. I continue debating the issue on its merits because I can’t win people over to my side by telling them to stop talking. The core argument I made was that Goldberg’s voice (and the voice of many who have access to major media platforms) is amplified far beyond those of the people she’s accused of bullying. These are folks who use a free-to-all platform and organize like hell to make themselves heard. I observed that perhaps people with major platforms are now feeling threatened and are pushing back. I am not making the argument that Michelle Goldberg’s position was wrong because she’s privileged. I’ve seen that argument made many times over social media and I make a conscious effort to avoid that argument at all times, even when I think it’s right. The problem with the argument “You are wrong because you are privileged” is that it completely discounts a person’s credibility without looking at the merits of their argument. This is not the same as telling someone that maybe they should step back and listen to folks who are directly impacted by a problem. This is a real problem in the Left where more privileged voices tend to dominate. It’s completely appropriate to tell someone to check their privilege when they attend a community meeting in a neighborhood that is not theirs, talk at people and take over the dialogue. When you see a group of old men debating reproductive health, or rich white people talking about what Black urban youth should do to get ahead — privilege can get in the way of a dialogue that would offer real solutions. In Gene Mark’s essay for Forbes Magazine “If I Was a Poor Black Kid,” Marks relays all of the free and cheap tools that poor Black kids could use to pull themselves up by their bootstraps. It takes a special kind of kid to succeed. And to succeed even with these tools is much harder for a black kid from West Philadelphia than a white kid from the suburbs. But it’s not impossible. The tools are there. The technology is there. And the opportunities there. His basic argument in this unintentionally hilarious piece is that the only thing that separates him from the inner-city youth who cannot get themselves out of poverty is his tech savvy. If only these kids had the wherewithal to buy a cheap computer and visit TechCrunch everyday, they’d all go to Harvard and be CEOs of major corporations. Now, does his privilege prevent him from seeing the immense systemic obstacles put in the way of youth in poverty? Probably, but I don’t know him, I can only make assumptions. I can only presume that as a white, upper-class, male he wouldn’t get it. But, the fact that he’s privileged isn’t why he’s wrong. He’s wrong because his arguments are stupid and fall short of showing the big picture. What’s in his heart isn’t relevant. Where privilege fits in this scenario is that as a white, upper-class, cis-hetero male, he’s more likely than others to be hired by Forbes — or any other mainstream outlet. That is real, testable, systemic privilege. This privilege means that his opinions hold more weight because he has access to outlets that less-privileged folks rarely have. That was the point I made in my piece on the “Twitter Wars.” Goldberg uses her privilege as someone who writes for The Nation to silence dissent. She could be using her high-profile to solicit new ideas, but she chooses not to. I wrote that she could also choose to ignore the criticism. When one gets “piled on” on Twitter, they aren’t being silenced. That’s hyperbole. You can simply ignore the @mentions and continue writing and having your voice heard. When folks accuse strong voices on Twitter of “silencing” them, they are really saying, “these people are poisoning the well at my expense.” Perhaps being “silenced” means putting out new ideas that make the status quo obsolete. When I think of being “silenced,” I think of blacklists. I think of censorship. I don’t think of people with less or equal power as me telling me I’m wrong. Her view may be due to her privileged life, but that’s not why she’s wrong. She’s wrong because her analysis was weak and her reporting virtually non-existent. Thank you for this. It’s very helpful, up to a point. However, I notice that your examples are all of cases where people are either right or wrong, independent of their social position. Things aren’t always that easy. Now I would say that someone who’s a pacifist, with a religious, philosophical, or other commitment to nonviolence, is neither right nor wrong, objectively speaking. The suitability of their ideas, and the appropriateness of their advocacy for them, has far more to do with their role in a movement than the quality of their positions. And the same goes for any of us who are acting in solidarity with someone else’s struggle instead of leading our own. However, I should add that “privilege” isn’t necessarily the best terminology for this distinction. If I’m acting in solidarity with public-sector workers who are doing much better than I ever have, it wouldn’t be appropriate for me to try to foist my own agenda onto their campaign, either, even if their privileges trump mine. >>The problem with the argument “You are wrong because you are privileged” is that it completely discounts a person’s credibility without looking at the merits of their argument. As you point out, “you’re wrong because you’re privileged” is almost the definition of an ad-hominem attack. You’re not even talking about the idea. You’re saying “that idea is wrong because you’re the one who said it,” which obviously doesn’t work. Can you please say a little more about this? It seems to assume that everybody who writes for The Nation is privileged. Is that what you mean? If so, how is that the case? What I meant by “privileged” in that particular line is that she has a credible platform with a built-in audience to espouse her views. It’s a privilege to write for the Nation. That’s not to say she didn’t work hard to earn her position, but the position itself is a privilege to hold in the marketplace of ideas. This amplifies her voice much louder than those who rely on free-to-all social media platforms like Twitter. Fair enough. I’m certainly not very literate with this language, but I’d always understood privilege as a kind of unearned advantage. It seems to me that if somebody fairly earns a position with a large audience (though I don’t know if Ms. Goldberg did or not), then it’s not so much a privilege as it is a benefit. Or, to put it more rhetorically, is every advantage also a privilege? Everyone who writes for an outlet with a large audience is privileged with that platform, by definition. Privilege is just access or ability that others do not have. When you’re told to “check your privilege”, you’re being told that either something you’ve said or done assumes an equal playing field where none exists – that you’re assuming that others have the same privileges as you, so it’s entirely fair for you to engage them or an argument with respect to them using your own experiences as a model for their situation or environment. It’s not ethically wrong (most people with privilege issues don’t notice that they’re doing it, and don’t interact often with people for who it’d be a problem; they just make bad political decisions), but it’s academically unhelpful, and can be hurtful to those on the receiving end (e.g., “oh, come on, you could just buy a $300 computer and $50/mo internet package, and spend lots of time self-educating on the internet, can’t you minimum wage worker?” It may be true – if that worker lives on ramen and doesn’t buy any clothing for a year or two, and does nothing but work, learn and maybe sleep. It’s hard, and it’s hurtful to have something dismissed as something you can “just do”). For months, I’ve avoided “check your privilege” because of its dialogue-stopping ability. 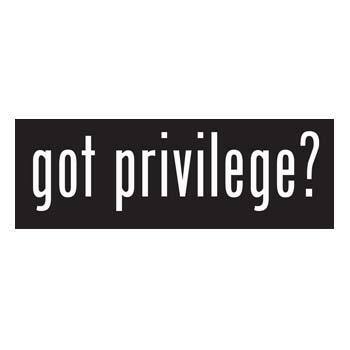 We, as well-educated progressives know what “privilege” is, but I think that in itself is something to check. Our understanding of seemingly common jargon is, seen in non-left-wing-intellectual circles as an accusation-of-unfair-advantage-therefore-you’re-wrong, rather than an identification of the speaker’s fallaciously assumed universality of environment. My workaround is this: if an argument from privilege stems from an assumption of access or treatment equal to that of the speaker’s; you can adjust the speaker’s erroneous argument by identifying those assumptions as they appear. As an example, if there’s the assumption that $300 for a cheap computer is something a person making $20k can just drop. This is a common misapprehension, and while it may be true for simple scaling – a person making $200k can simply drop $3k on hardware ($300:$20k::$3k:$200k) – that’s really not how it works. Someone making $200k has a much smaller proportion of their income invested in costs of living than someone making $20k. That’s what “paycheck to paycheck” means – you have little to no spare cash. Someone making $20k might be able to squeeze out $1k of spare cash annually – for savings, emergencies, etc. The $200k earner could probably save half her earnings. So the impact equivalency is more like dropping $30k to someone making $200k (i.e., $300:$1k::$30k::$100k). The only person trying to silence anyone is you, by saying her reporting was “virtually non-existent.” She interviewed several people including Mikki Kendall and unearthed several past feminist writings as examples. Is “virtually” your weasel word, so you can sway people who didn’t read Goldberg’s piece to think she did no reporting, but also to defend yourself against being called a liar because we can agree to disagree on what virtually means? All your blog posts are just extensions of Twitter war posturing. Look in the mirror. Reblogged this on MiscEtcetera v2. This entry was posted on February 6, 2014 by Kenzo Shibata in Class War, Politics, rhetoric, Uncategorized and tagged internet, left, liberal, Michelle Goldberg, online, privilege, toxic, Twitter, twitter wars.